Today, we’re delighted to announce one of our closest and most valuable integrations yet. Kaseya creates software used by more than 10,000 customers, specialising in IT management services. Over the last few months, we’ve got to know the Kaseya team well. They’ve been a delight to work with and through a combination of customer demand and working together with the Kaseya team, we’ve created a unique 2-way integration. 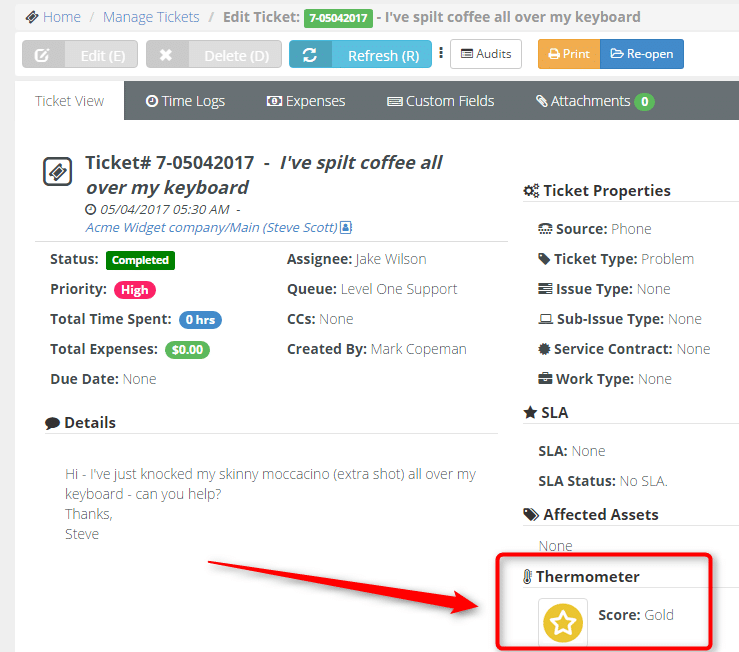 As of today, customers are now able to embed Customer Thermometer feedback buttons into Kaseya BMS tickets, prompting customers for feedback on resolution of, or during a ticket. 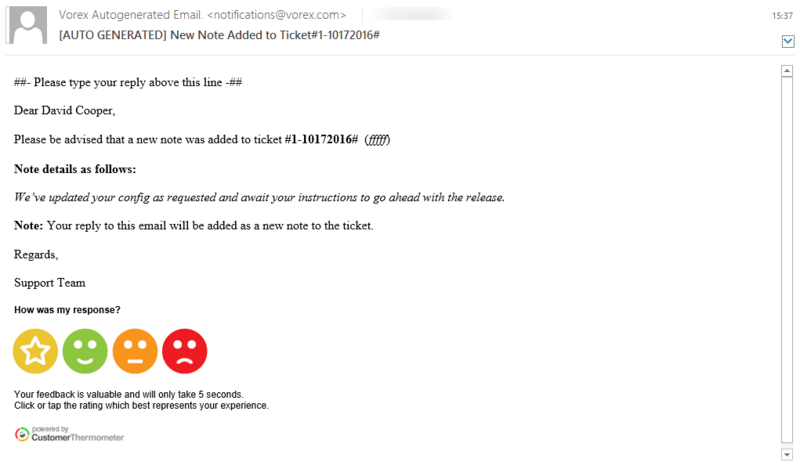 After setting up a Kaseya BMS (or Vorex) Embedded Thermometer within your Customer Thermometer account, customers can then configure their Kaseya BMS workflows and email notification templates to generate feedback requests when they need them. The setup process takes around 30 mins. Depending upon your configuration, ratings and comments left by customers will display directly on Kaseya BMS ticket screens as well as within your Customer Thermometer account. Brightgauge dashboards can also be used by customers to display metrics from both applications. With no other native or 3rd party method of requesting and storing feedback on Kaseya BMS tickets, we believe this is a big step forward for Kaseya BMS customers. Customers love giving feedback – you just need to provide them with the right mechanism at the right time. We’ve created a short 5 min demo, where you can watch a use case in action… Watch how easy it is for customers to register their feedback … see it triggering escalations and feedback arriving within the ticket and inside the Customer Thermometer account. Want to get up and running? If you’re already a Kaseya BMS (or Vorex) customer, you’ll need to sign up for a Customer Thermometer trial, which you can do in seconds here. You can also visit our stand at Kaseya Connect in Las Vegas, NV between 9-11 May. We absolutely play nicely with the Service Desk module within Kaseya VSA too. For full integration instructions, visit the Kaseya VSA integration page.